While fans mostly talk about the potential for Marvel Studios to play with the X-Men and the Fantastic Four now that Disney has hoovered up 20th Century Fox, it’s worth remembering the roster of top-draw villains they’ve just got the rights to as well. Of course, the best of the bunch is Galactus, the Devourer of Worlds. He’s got to be one of the few antagonists in the Marvel universe who could legitimately be considered a bigger threat than Thanos, so he’s really a must to appear in the MCU’s Phase Four. But what would Galactus look like when he shows up on the big screen? Well, one talented fan, who goes by the Reddit username of TruthOrGjallarhorn, has shared an epic piece of artwork which depicts a lone Iron Man bravely facing a ginormous Galactus. The villain’s portrayed very closely to his traditional comic book incarnation, but with his bright purple suit replaced with mechanized armor. This is an excellent effort and is a genuinely believable take on what Marvel Studios’ Galactus could look like. You can easily imagine him being brought to life with the same painstaking CGI that made Josh Brolin’s Thanos such a fearsome foe in Avengers: Infinity War. As for who could play this planet-eating monstrosity, two MCU stars in Tom Hiddleston and Laurence Fishburne have already offered their services for the part, but there’s countless other options as well. As we said, Galactus would be a terrific choice for the big bad of Phase Four, and one fan’s already devised a theory for how that could come about. They put forward the notion that perhaps Galactus already exists in the MCU and was locked in the Quantum Realm by the Asgardians millennia ago. However, Thanos’ actions with the Infinity Gauntlet rip reality enough for him to escape and wreak havoc on the universe once again. 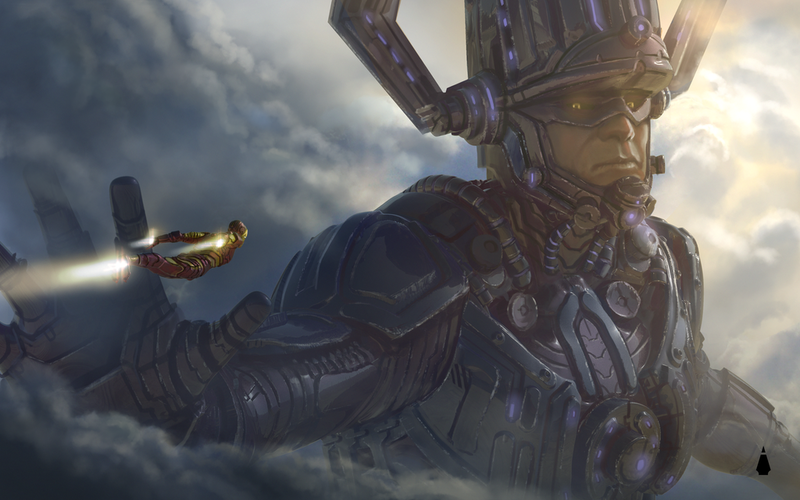 It’s a cool theory, and like this amazing artwork, shows that there’s a lot of potential for Galactus in the MCU. Let’s just hope Kevin Feige and his team make use of that potential in the next few years.